To help promote your next event effectively, start the marketing plan weeks ahead of the event day. 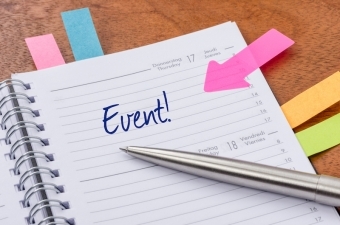 This 12 step checklist will help you plan what to do in the weeks leading up to the big day to help you promote your next event . To have a winning event, use this checklist as some of the event marketing action items you don’t want to miss in the weeks leading up to the big day. They are listed in the recommended order they should happen. Design the main images or graphics that can be customized and used across all marketing materials, such as the website event page, flyer, and social media posts. Talk to your design team to see how much lead time they need for creating graphics, print materials & website updates. Make sure your website is up-to-date! Sales material, contact information, etc. Create an event page on your website with the relevant information from the event brief, as well as links to social media event notices, and other relevant websites. Keep updating this page as needed. For instance, once the Facebook event is created, you might want to encourage people to visit you there! Make sure the event page, or notice has its now URL for sharing on social media, and measuring traffic. If you have an events section or calendar on your website, post it here. If you don’t have a specific events section, you can always post it as a blog and create a category called events. Make sure you have all the important information on this page from the event brief. If your event requires registration or ticket sales, make sure the price is on the main page with a link to the registration page. Eventbrite & Bruha are a couple 3rd party online registration companies that can streamline the registration process. Send an announcement/event brief to the event organizer with links to your website page. If you are offering a contest winner, have a special guest, or doing a demo, they will often add that to their agenda & help promote it. Send out a notification to media and other influencers via email, social media, or event a print invitation. This can be in the form of a press release or marketing material that has a link to your website. Make sure you customize your email to each person with a specific call to action. Interested media outlets and journalists are the typical audience you would send an event press release too with the hopes that they will pick up the story, but also consider other influencers. These may be niche media outlets, online bloggers, or even local community advocacy groups or business owners who may want to attend or encourage their group members or customers to attend. 6. Send out an event notice to your email subscriber list. If you don’t have an email subscriber list, one of your goals for the show could be to collect emails from people interested in your company updates. Use a third-party subscription based program like MailChimp or Constant Contact, create a form to capture information, create a page on your website with the embedded form, using an iPad you can collect these names at the show and then upload them when you have connectivity. If you have to, use a print form but make sure it is CASL approved and you retain this paper documentation of their consent. 7. Schedule social media posts! Weeks leading up to the event make sure to share the event with your social media followers. Create graphics and even short videos, and then share and engage with your audiences to help build the excitement. Social media posts topics might be about what you are going to do at the event, promotions you are offering, people who will be attending, keynote speakers, a countdown, early-bird registration, etc. Add a notice to an email signature on the team with a link to the event page. Create an editorial calendar for the event; who needs to be interviewed, will there be live video events, who needs to be involved, etc. Make sure to include pre, during & post activities and who is tasked to do what. Make sure all company social media profiles are created, up-to-date, and logged into on phone for whomever is doing live posts that day. Make sure they are scheduled, have passes, have a script, schedule is created & distributed, where will the products will be after the event, including the timeline for completion.